Passengers needing to top-up on line might go to a Transport for Canberra site, rather than ACTION. Makes sense, especially if MyWay is extended to non-ACTION public transport operators in the Canberra Region in the same way as MyKi covers both government and non-government transport operators in Victoria. Here is my first MyWay paper ticket. Initially standard (Adult fare) MyWay cards will be available for free, but a minimum $10 top-up will be required. Pre-loaded cards will be available for 12 months from "ticket agents" (presumably standard fare only). Fare cap will apply against daily and monthly usage (and presumably off-peak daily) - no mention of weekly or school term cap. Still no mention of how park and ride permits will work with the new system. Today spotted a brochure in Bus 852 (MyWay equipped) with a brochure relating to the new paper tickets that the MyWay equipped buses have. The information isn't much different to what is on the website, cool thing is the website at the bottom of the brochure is www.transport.act.gov.au this takes you directly to the MyWay page on the ACTION website. The MyWay page has been updated to include when the MyWay cards will be available (Mid January 2011) & when the magnetic cards will no longer be able to be used (April 2011). Then after 2011, the left over value from old magnetic cards can't be transferred. cool thing is the website at the bottom of the brochure is http://www.transport.act.gov.au this takes you directly to the MyWay page on the ACTION website. That's a temporary re-direct until the full website is ready. After June 2011, the unused value on pre-paid tickets cannot be transferred or refunded. I assume you got the info and will be passing it on to everyone? They were only handing out the paperwork for the trial this morning, great to see that forward planning at work again. I overheard one of the TAMS guys today saying that the trial is pretty close to starting & things seem to be going pretty well so far. The only issue has been a red light coming up on the drivers units which has to do with the GPS identifying each bus stop. Apparently TAMS workers are checking each card to make sure none are duds before the trial begins. New MyWay software was being trialled by several Tuggy drivers yesterday; if it works, it will avoid the need for drivers to 'select trip' at both the depot and again at the interchange when starting out. Also featured the enlarged and simplified digital clock - big improvement. As well at the new MyWay Centres, Canberra Connect shopfronts will also provide MyWay transport services (that is how it is listed on the shopfront directory). Well Tuggeranong at least as it now has a MyWay module & at the other end of the shopfront is the pockets for all the timetables. About 350 Canberra commuters are taking part in a trial of ACTION's new electronic bus ticketing system. The MyWay smart card is being trialed throughout December by a mix of students, adults and pensioners. Tom Elliott from the Department of Territory and Municipal Services says the trial will help to identify any problems before the $8 million system is rolled out to all bus users. "It's a very important step for us to make sure all the work we've been doing on ensuring the processes of recording patronage data and revenue in fact works and also to get some feedback from passengers," he said. "We're really testing it to see if it's actually going to function well for us or not and refine it before we do a 'go live' to the general public." Mr Elliott says the trial could be extended if needed. "If all goes well and the customer feedback is good, our trial users give us a bit of a tick and say 'yeah that worked well for me', or if they give us good feedback that's nice and easy for us to practically adapt and implement then we would be hoping to release this to the general public sometime in January," he said. The Road Transport (Public Passenger Services) Regular Route Services Maximum Fares Determination 2010 (No 1) (the legislative instrument which controls ACTION's fares) has not been updated to take MyWay into account. Given that MyWay cards are being accepted as payment of bus fares, I wonder what the legal implications are. Quote why is the card reader set at a relatively low height? This has been done to conform to mobility access requirements. Yeah, Those low floor Renault's and such........ The readers on the Scania, Irisbus and MAN vehicles are fine. It is only the High Floors which have a low height reader, so stating Mobility Access is BS. Do I have to remove the MyWay card from my wallet or purse to tag on and tag off? The card reader should be able to read your card while it is inside your wallet or purse, but it is recommended it is kept away from other similar cards that may cause communication errors. Remember to check the display on the card reader and listen for the tone to ensure your card has been read correctly each time you tag on and tag off. Glad to see they have addressed this.... with an FAQ Just a tip, do not have a Myki card anywhere near a MyWay reader! In the video featured I recognize every person there as an ACTION employee. Looks like they are about to go 'live', pamphlets were available on 966 today, still no date, but can't be far off. I am sure they used fake beeping in that promo video, as my card has never tagged on or off that quickly. Latest news: Seniors Card holders are being converted over to MyWay cards in February, and general public MyWay cards should be available from early March. Pre-loaded $20 cards will be sold at existing ticket agencies. No news yet about the change-over timeframe (how long will be magnetic tickets continue to be accepted, when will off-peak tickets cease to be sold on bus). This is has all the fare structre information for the new MyWay ticketing system. It contains info on the new off-peak single trip for both adult and concession fares, and also confirms the ceasing of availablility for off-peak day tickets to purchased on-board the bus. 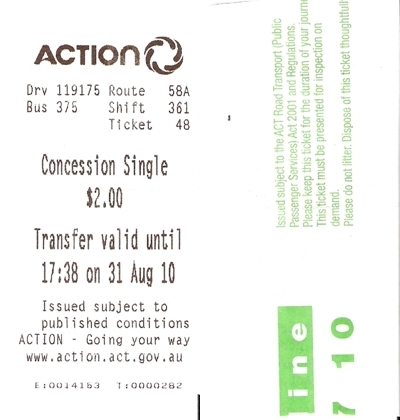 The new Road Transport (Public Passenger Services) Regular Route Services Transitional Maximum Fares Determination 2011 (No 1) took effect on 14 February 2011. Technically, off-peak daily tickets are now only available as "Magnetic Ticket" fares - they are not listed as Cash Fares. But they've also modified / stuffed up the definitions for the Magnetic Ticket concession fares. Again, technically, the Pensioner off-peak ticket does not apply to "Students"; and "Tertiary Students" are not entitled to any concessions with Magnetic Tickets since they have been excluded from the definitions. Way to write a Determination, ACT Parliamentary Counsel! Does anyone know if Gold Card holders (Over 75's) will be issued with a new Gold MyWay card or just show their current card? ACT Bus Presents: Sentences that have never been written... until now! did anyone get the win news article on it, that aired last night. So I had another look at the Determination (because I wanted to modify some information I'd put onto Wikipedia and actbus), and noticed some more errors/omissions. For instance, Shoppers off-peak daily and Concession off-peak daily are defined but there is no definition for Week day off-peak single trip or for Non school day (that's what it says - even though it should say Non school day single trip). How can you charge a fare at certain times without defining the times when the fare will or won't apply? There is insufficient information about how the default fare (failure to tag off) will work - especially when you consider that the Concession default fare is more than the weekend daily cap. (Daily cap is defined as "the maximum amount charged for MyWay smart card fares on a daily basis." Since the default fare is included in the MyWay fare schedule, then how can the default fare exceed the daily cap?) Similar question for the Monthly Trip Cap and the School Term ticket. I also wonder whether the Weekday off-peak single trip fare will start to be used in the same way as Adelaide's inter-peak fare. To explain - Adelaide has a cheaper fare (available both as cash and pre-purchased) which applies between 9.01am and 3pm but includes a 2 hour transfer. So what some/many Adelaide commuters do is get on a bus/tram at just before 3pm to validate/purchase their ticket; if they then catch their bus/train/tram home before 5pm they will have only paid for an off-peak ticket. I loaded a few more MyWay brochures into the ACT Bus Gallery. Breaking News: the School Term ticket has been withdrawn. All reference to School Term tickets have been removed from the MyWay website and the monthly trip cap for School Students (but not Tertiary Students) has been reduced to 26. Which answers my question as to how the School Term ticket will work: it won't. A new version of the MyWay Fares brochure has been loaded on the internet, but the printed versions I collected today are still the old ones. The new brochure is still silent about the times when off-peak fares apply. The new brochure is still silent about the times when off-peak fares apply. Off peak details have now been included on the MyWay fares page. ACT Bus articles (FAQ and fares) have been updated to include this information. For those that aren't aware, ACTION have issued special single ride tickets for those on certain Centrelink benefits. These cards aren't made of plastic (unsure of the material) & have the same design as the MyWay cards, only difference is the ACTION colours on the blue, white & yellow. These are in effect until permanent cards are sourced, I suspect these permanent cards will be special MyWay cards that are valid for 24 hours from first tag on. This is the same system in Perth & are issued to job seekers who catch the bus for a job interview & if the job seeker tags on at 09:00 Monday, said job seeker can tag on & off any bus until 09:00 Tuesday. The MyWay website has been updated in an attempt to clarify the School Student fare. The $1.70 daily cap applies to weekends and public holidays only (rather than non-school days as previously stated), but the $0.95 fare should only apply on school days. Unfortunately, the website is not showing this correctly, but the PDF fare brochure is. In news which probably comes as no surprise to anyone, Transport for Canberra has extended the MyWay "transition period" (during which the failure to tag off penalty will not apply) to 31 December 2011. A MyWay Reload Agent is being requested for the Cooleman Court area (http://www.procurement.act.gov.au/tenders_advertised/tender_download/open_tenders/17022.110). I saw an ad for MyWay on Channel Ten this morning during The Circle. I almost dropped my crumpet. While I admire the fact that there is an actual ad for public transport (instead of the 10,000 ads a day for cars with people driving alone through the mountains as opposed to the reality of sitting in the Barton Highway morning traffic jam) i question the time it was played. It was played during Ten News last night also. She wouldn't have appreciated that.. The new Fare Determination has come into effect (from 7 October 2011). There have been some adjustments to concession fare eligibility (including making Health Care Card holders eligible for concession fares and extending the definition of student fares to all Australian students). But they've also modified how Default Fares will work. There are two defined Default Fares (although both apply the same fare): Default Fare and Default after cap Fare. Definition of Default Fare has also been extended to apply to failure to correctly Tag On or Off. Default Fares are $1.48 (Full Fare) and $0.74 for Concessions/Students. In the case of the Default Fare (where no travel cap has been applied), you would be charged the default fare on top of whatever initial fare is applied. So the maximum fare would be $4/$2 but will be less when off-peak fares apply ($3.48/$1.29). Where the travel cap (daily or monthly) exists, then you would be charged JUST the default fare if you fail to correctly tag off (as far as I can work out). I guess we can find out in two months time exactly how this works.